Analysis of crime statistics provided via Freedom of Information Act requests last December showed that each day of the holidays crooks committed an average of 448 burglaries, 65 robberies and 1,082 thefts. 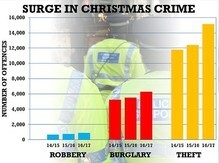 The total number of thefts over that festive period recorded in England and Wales climbed from 5,524 in the financial year 2015 to 2016 to 6,278 in 2016/17. Robberies increased by 20 per cent from 770 in 2015/16 to 918 in 2016/17, Meanwhile thefts were up 22 per cent to more than 15,000 over last year’s holiday compared to 12,398 the previous. In addition to the impact on both commercial and residential properties, attention is also focussed on construction sites, almost all of which are closed down and left unguarded over the festive break. According to the Chartered Institute of Building, who published a guide to construction site security last month, 92% of construction sites experienced theft last year. VPS Security recommend homeowners and tenants use the police.uk website guide on crime prevention, and for local authorities, housing associations, commercial, retail and facilities managers to at least seek a risk assessment of their vacant property portfolio. Their own guide to Smart Technology also offers up-to-date information on security solutions above and beyond the deployment of guards, able to be adapted to create the best fit-for-purpose security solutions for housing and commercial units as well as for construction sites. VPS is a leading service provider for the protection of people, property and assets on a temporary or emergency basis. It leads the European vacant property services market, providing a full suite of specialist solutions across the complete property lifecycle, as well as offering a wide range of Property Services for occupied property, from locks and glazing to grounds services and remote site security. Activities cover security solutions (including its JCB Smart Tower CCTV and recently launched JCB Alert Tower product range, steel screens, manned guarding and live-in guardians), and property management (clearing, cleaning, waste disposal, maintenance and grounds services). In addition to key insurance customers, VPS works with social housing organisations and a wide range of commercial customers, such as property managers, retailers, industrial, construction and infrastructure companies. VPS has been recognised for both its customer care and contribution to standards in the security sector, winning both categories at the IFSEC Security and Fire Excellence Awards last month.